It has been apparent to me for many weeks that Leo was well into the teething stage and sooner or later I was going to be faced with the fact that, my gorgeous boy's gummy smile was going to be gone, and in it's place would be a guppy toothy smile. Last night I found Leo's first tooth. I could not believe it! 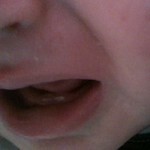 Leo is 28 weeks old (6 months) and the first tooth to arrive is his front bottom left. You can just see that is has broken through his gum and is sharp to the touch! Thank god I am not breast feeding! Many emotions were running through me last night. Happiness, excitement and also sadness. You may question the last - sadness, but you see that now his first tooth is here, it is another milestone that has been laid down and I don't think I am ready for Leo's baby days to be numbered. It is now only a matter of time before more teeth pop up, and my how I love his gummy wide smile. The discovery of his tooth occured when Leo woke up after about an hour of me putting him down last night, he must have known that I wanted to sit down and watch One Born Every Minute. I was looking forward to watching the water birth. So Leo was sat with me while I was watching and reminiscing the day he swam into the world, and Leo was sat watching us in the mirror that is adjactent to where we were sitting. I grabbed some teething gel and began to rub it around his gums and there it was...just sitting there waiting to be discoverd. I am very excited that his very first tooth his here, and as soon as I can get a clear shot of his mouth I will make sure I take a photo. I don't think I will get much co-operation on this front however. I am fighting a losing battle, but Leo knows by now that I do take many, many pictures. He may even think that the camera is part of me! All the changes that have come around recently have got me thinking about how amazing they all are. They all occur in such a short space of time. One minute they cannot do anything for themselves and the next they are wanting to sit on their own, and then bam...there's a tooth. The next step I guess is crawling....my oh my! When Leo was born, Luke and I discussed the best way in which we could capture Leo's facial changes. We decided that the best way to go forward with this was to take a weekly photo. We now have 28 weeks worth of pictures that show Leo right from newborn to current day. Now Leo has a tooth this is going to be one more change that comes into the aspect of these photos. We have not discussed how long we intend to take these pictures for, but I will carry on for the foreseeable future as it will be lovely for Leo to see these changes for himself one day. I plan on sharing these pictures around Leo's first birthday. For the last few weeks I have been trying to get Leo to use a tippy cup, I have tried 3 now and had no luck at all. He did not want Tomee Tipee....He did not want anything. So I resorted to using a Doidy cup, and he decided that this was fine and allowed me to give him water through this. Today I found another beaker that we had been given, and thought that I would give it a try just to see what happened. At first it was a failure just like every other attempt, but then....Leo decided that he would drink it! He was holding the handles on either side so I let go...and Leo drank from it all on his own! It is times like this I am so glad I created my Blog, It is already a record of Leo's life. When he is older I will sit down with him and show him all of the posts and pictures, and I hope he will be proud. When did your baby's get their first teeth in and decide they were happy to use a tippy cup for the first time? Hello to every one, because I am genuinely eager of reading this webpage's post to be updated regularly.